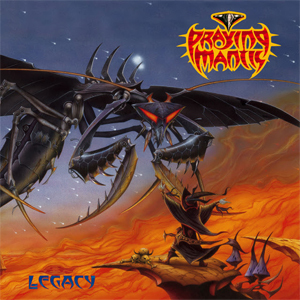 NWOBHM rockers PRAYING MANTIS will release their 10th studio album, Legacy, on August 21st. Legacy is the first recording to feature the two new members from the Netherlands, John “Jaycee” Cuijpers and Hans in’t Zandt (vocals and drums respectively), who have truly provided a new dimension to the writing process and musical performances. Together with the prolific songwriting talents of Chris Troy and guitarists Tino Troy and Andy Burgess, they have been instrumental not only in the writing of the new songs, but in providing a new vision in terms of the sound engineering and production. The recording of the album was carried out in various recording studios in Belgium, Netherlands and UK. As per the previous record, Sanctuary, the mixing of the new album was done by Andrew Reilly in his studio in Atlanta. The first single, “Fight For Your Honour” will be accompanied by a video shot while the band performed the song for the first time at their acclaimed performance at the Frontiers Rock Festival II in Milan, Italy. One of the most influential and famous artists in the rock field, Rodney Matthews (MAGNUM, DIAMOND HEAD, ALLEN/LANDE) has been commissioned to do the artwork for the album in the same style and stunning quality that so many fans loved on the original MANTIS albums like Time Tells No Lies and the later album Predator In Disguise. PRAYING MANTIS are a well-established band of melodic hard rockers. They were formed by brothers Tino and Chris Troy in 1973 and together with bands like IRON MAIDEN, DEF LEPPARD, SAXON and others they spearheaded the NWOBHM movement. While they did not see the same dizzying heights of success as some of their contemporaries, PRAYING MANTIS nonetheless became one of the most influential bands of the New Wave of British Heavy Metal (NWOBHM). The band has remained active over the years and still record and play live regularly. LO-PAN Release New Single, Video For "Ten Days"
DUFF McKAGAN Releases New Track "Don't Look Behind You"